The reaction to my article on the “ecotechnic dictatorship” garnered a vigorous response on this blog, and more of a vitriolic one elsewhere (see below for a summary). So let’s ask the question outright. 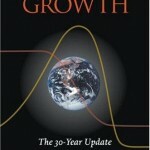 Suppose that all your observations and models indicated that business-as-usual would doom the global industrial system to collapse, causing the premature deaths of the many surplus billions it now supports on a “phantom carrying capacity” based on fossil fuel-powered agriculture, industrial fishing fleets, and a stable climate. In this hypothetical scenario (IMO, no longer very hypothetical at all), would it be ethical to support the coming of an “ecotechnic dictator”, a despotic Messiah, who would suppress individual freedoms in order to force an unwilling populace into making the consumption sacrifices needed to avert the Crash? Due to the limits to growth on our finite planet (in the form of resource depletion and pollution overload), business-as-usual will most likely lead to a brutal endgame of resource wars and rising chaos. Each nation will do its utmost to postpone its own collapse so as to be left the last one standing, picking on the corpses of its enemies before succumbing in turn. The ensuing collapse of the Earth’s carrying capacity and the universal demise of the state’s monopoly on violence will usher in a period of globalized anarchy and Malthusian dieoff. Liberal democracies, beholden to a human electorate evolutionarily hardwired to favor short-term comforts and discount long-term risks, even if said risks are catastrophic, are very unlikely to be able to make the drastic cuts in consumption necessary to realign us with the planet’s limits. Even less likely to succeed are the brittle tinpot dictatorships, beholden to their corporate group backers and of an essentially reactionary character, that will proliferate in the last years of industrial civilization. Yet even the dictatorships will give up the ghost before too long, overwhelmed by the pressures of sustaining complexity on a diminishing resource base, and after them, le déluge. True, there’s always the possibility that the current system will innovate us a technological “silver bullet” that will save us (e.g. cheap nuclear fusion, massive improvements in solar technology, or a “technological singularity“), or at least kick the can down the alley for another generation to deal with. But as I pointed out in the original post, this isn’t too likely (perhaps 20%). However, though I am skeptical about the state’s ability to prevent global collapse, there is zero chance of individuals or communities saving us – be they Orlov’s vegan seafarers or gun-stocking doomsteaders in the Rockies – because their actions are by definition localized, whereas our sustainability crisis is profoundly global. It will be the “tragedy of the commons” writ large. Since individuals and communities get big, short-term benefits (pleasure) from increasing their material throughput, whereas the long-term price (pain) will be paid by the whole world, there is very little incentive to live sustainably until Nature forces them to. Yes, some communities, against all the odds, against human nature, and with enough prior resources and foresight, may prove to be “resilient” in the face of collapse. Yet even they will be beset by a panoply of problems, including “zombies” (e.g. climate refugees), marauding violence-specialists, and the vagaries of the unsettled climate system itself. If there’s one thing we can be sure of, the extraordinary hardships, deflated expectations, and mortality rates that will follow in the wake of the Crash will be enjoyed only by the most committed nihilists. I do not like the conclusions, but my research has led me to believe that the only more or less realistic chance (75% ?) of averting the Crash lies in harnessing the power of Leviathan (the state) to force through a “sustainable retreat”. 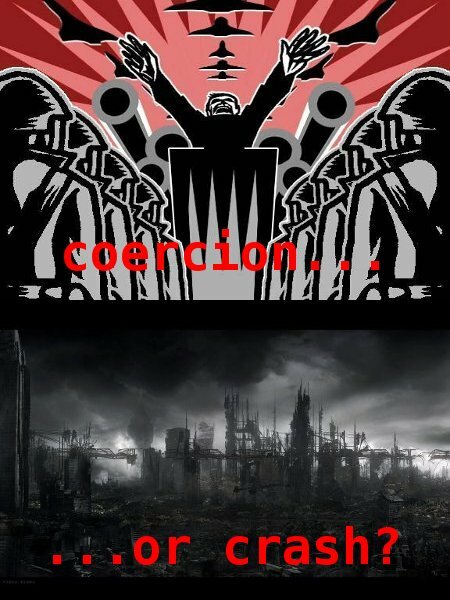 In an ideal world, this “ecotechnic dictatorship” will not worship coercion or authoritarianism as ends in themselves, but it will possess a mandate to employ them when absolutely necessary in order to build a sustainable ecotechnological civilization. It will use its concentration of administrative and coercive power to implement necessary projects, foremost amongst them a transformation of the energy system from reliance on fossil fuels to nuclear, wind, and solar. The state will discard traditional measures of economic prosperity such as GDP in favor of one that fully accounts for social equity and ecological costs. It will restrict free markets, and perhaps abolish them altogether in favor of cybernetic planning that allows for the optimization of resource usage, pollution emissions, and social equity. And if it becomes absolutely inescapable, it will attempt geoengineering in a “final gambit” to preempt runaway global warming apocalypse. 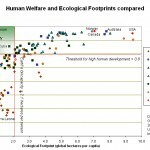 Once we are back below the limits, have discarded individualist and accumulative values in favor of voluntary commitments to sustainability, and are enjoying a decent measure of ecotechnological prosperity, there can be a gradual relaxing of controls, as the strong hand of the state slowly withers away into “Green Communism“. Even should the “ecotechnic dictatorship” fail in its endeavours to avert a Crash, at least the work it did to mitigate it and to preserve our cultural and scientific legacy in secret repositories across the world, will stand humanity in better stead to retain and rediscover civilization in the Tenebrae after the lights go out. I acknowledge that the above – a strict but fair “ecotechnic dictatorship” – may really be a wildly optimistic best case scenario, rather than a realistic one. Privilege may subvert its egalitarian ideals – after all, any state’s supporters are always more richly rewarded than its detractors, otherwise what is the point of serving such a state? Maybe the paranoia of its rulers, stoked up by a few coup attempts or insurrections, will cause it to go overboard on repression. Perhaps it will even degenerate into a kind of millenarian cult, like Pol Pot’s Cambodia. As the commentator T. Greer correctly pointed out, the ideological foundations for a descent into unbounded chiliasm are certainly there. Is this the choice we are going to face, and will it even be ours to make? To summarize. 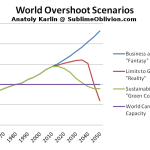 Our Brave New World has no future (business-as-usual). Ahead of us, we can choose between Brazil followed by Mad Max in Waterworld (tinpot dictatorship followed by collapse into anarchy and climate havoc), or alternatively, a global Project Cybersyn Reloaded if we’re lucky or Equilibrium if we’re not (“ecotechnic dictatorship”), after which the world may morph into Avatar (“Green Communism”). Finally, in response to the critics who say I am an aspiring tyrant, I should note that I am not forcing these ideas of “ecotechnic dictatorship” on anyone. I am not an activist, I am an observer and theorist. The sum total of what I have done is outline why our Faustian bargain with fossil fuels may yet be our undoing, and argued that at this late hour the surest way of sidestepping this bargain will entail substantial, perhaps prodigal, restrictions on the freedoms that we have gotten used to in the fossil fuel-enabled Age of Exuberance. You are free to take it or leave it at your own, and the world’s, risk. If you want more discussion on “collapse ethics”, head over to Lou Grinzo’s blog Cost of Energy and read his post Simple steps and dark hopes, which asks the question of whether it is ethical to hope for a dramatic climate catastrophe if we’re convinced it would be the only way to force us to take meaningful action before it’s too late. To those who say yes, let’s go even further out of the comfort zone: would it be ethical to actually orchestrate those catastrophes, like the villains in Michael Crichton’s book denier propaganda tract State of Fear? Have fun with the dilemmas.